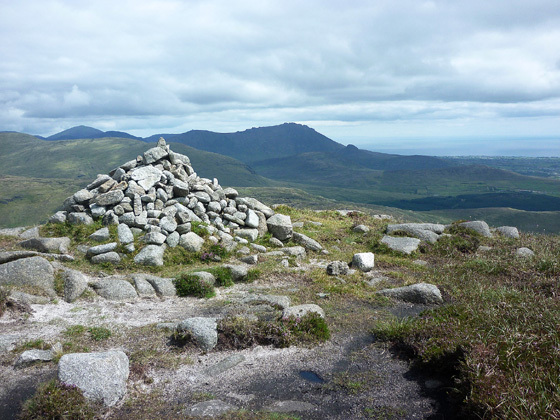 Picture from group : Looking E to Slieve Binnian from Eagle Mt. summit. Picture: Looking E to Slieve Binnian from Eagle Mt. summit. Route 1:Start Leitrim Lodge car park J224 257 A. Follow the track SE to J232 244 B. Go up left (E) over a small col before dropping down SE to cross the Rocky Water stream. Continue up in same direction to the Windy Gap J246 236 C. Turn steeply up right (SW) and follow line of Batts Wall for 500m. Where it turns sharp left follow it along for 300m, cross a stile and walk the short distance out to the summit cairn. Route 2: Start from Attical Community Centre car park J268 189 D. Go NE and turn into Sandy Brae. Follow along for 2k to a small foot bridge J263 206 E. Once across go left and follow a stone wall up to and over a stile. Head NW up the spur picking up a track J25253 21673 F and then up to a check point J2479222303 G. Continue up along the high right edge of the steep east face of the mountain to gain the top (summit cairn). Return by way of ascent or for a looped walk go the short distance across to Batt's Wall and follow it NW along the crest and then steeply down NE to Windy Gap J24650 23675 H. From here a right turn SE soon leads to a track which can then be followed down to Sandy Brae and back to the start.